The demons once defeated the gods and started ruling the world. They caused a lot of destruction. The gods went to the all powerful Brahma, the creator of the universe. Brahma blessed them and asked them to fight the demons again. This time the gods won and got their kingdom back. The gods started celebrating their victory and forgot their duties. They became very proud forgetting that they had won because of Brahma's blessings. Brahma decided to teach them a lesson and sent a Yaksa (demi-god) to their kingdom . 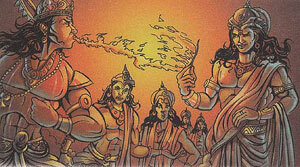 When Indra, the king of gods, saw the Yaksha, he sent Agni, The god of fire, to him. Agni said, "I am the powerful god who can burn anything, " The Yaksha gave him a blade of grass and asked him, "Can you burn this?" Agni laughed and said, "This is such a small thing, I can burn it in a second ." Agni tried to burn the blade but failed. Ashamed, Agni returned. Then Indra sent Pawan, the god of wind. Pawn told him that he was a powerful god who could blow away anything. The Yaksha gave him the same blade of grass and asked him, Can you blow this away?" He placed the blade on his palm and blew at it, but couldn't even move it. he also returned in shame. Indra then went himself. The Yaksha said, "You gods have become so proud that you do not recognise that I am Brahma's messenger. I have come to make you realise that it is the most powerful and who made you win. Now leave your pride and fulfill your duties."